Bistro du Vin is the firs standalone restaurant from the people behind Hotel du Vin, and wow, is it pretty. Located at the much-lauded and sadly closed Eastside Inn (rest in peace) on St John Street, they really outdid themselves. It’s sleek, still has that lovely open kitchen and has just enough French influence without being too ‘Cafe Rouge‘. I was invited to come try it out after hearing quite a bit of fuss over its opening. 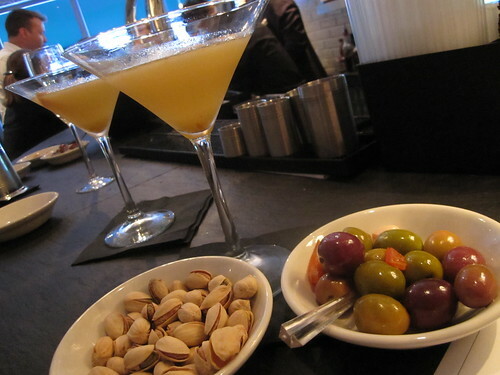 We got there a bit early and decided to sit at the bar for a quick drink – the Marmalade Martini (£10). It was the perfect aperitif, crisp light and just enough to dazzle the taste buds. 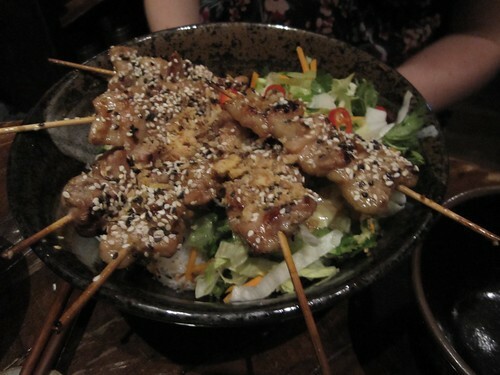 It was also served with bar snacks, which generally scores big points in my book. 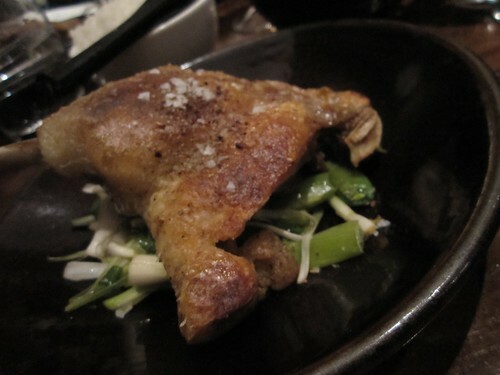 Sitting down, we took a look at the expansive menu. For the vibe of the place, I’d call it competitively priced. Most starters were around the £7-£10 range, while most mains were around £15 (steaks and lobster obviously quite a bit more). 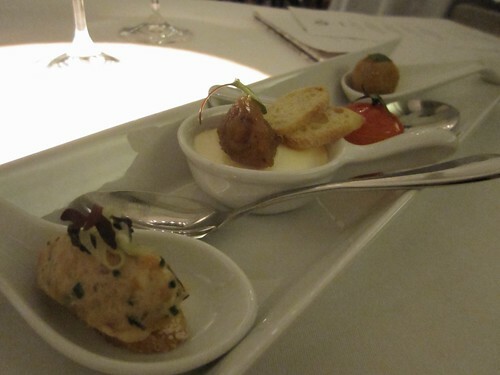 After going back and forth, I decided on the Cornish crab, toasted sourdough (£9.50) for a starter. Our server told us it was the most popular on the menu, which I’m guessing is more because it’s crab, rather than because it’s a showstopper. 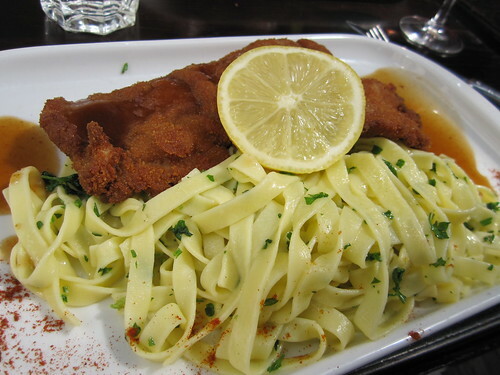 It was alright (a bit too cold and bland, it needed quite a bit of lemon to jazz it up), but I wouldn’t repeat the order. 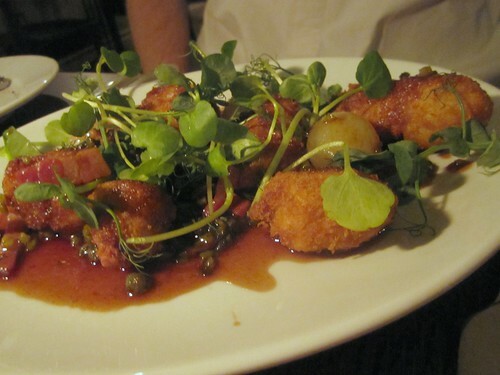 The Crispy lambs sweetbreads with sauce charcuterie (£8.75) were a much nicer choice. Besides being much more pleasing to the eye, these were quite moreish, but then again they were fried, so really, what’s not to love? Doing the math(s), it works out to a whopping £3.66 per shrimp and scallop. Outrageous highway robbery. Full stop. 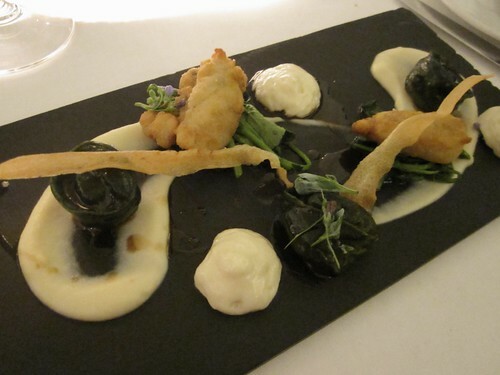 To add insult to injury, the prawns were overcooked and the scallops inconsistently cooked. And have I mentioned how difficult it is to cut through something when it’s sitting on a perforated concave shell?! I don’t know what they were thinking. Disappointment incarnate. Thank god the Saucisson à la lyonnaise, ratte potatoes and Dijon (£15.50) was better. 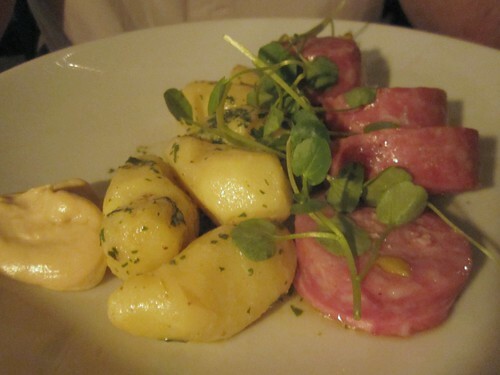 A much more generous portion, lovely little potatoes and sausage that almost had the distinct flavouring of chorizo. It was a man’s meal, and this pleased DQ (I’m playing around with an alias for the boyfriend. Bear with me) greatly. 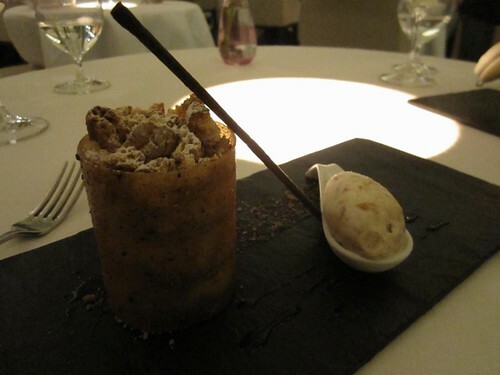 Desserts are where Bistro du Vin really shined. We ordered the Chocolate Pave and Strawberry Sundae (both £5.50). 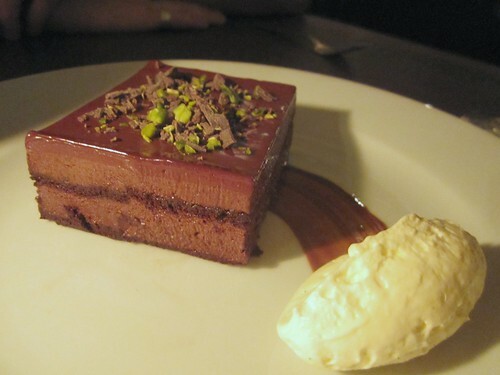 The chocolate was rich, but the portion size helped it be not over the top. Bonus points for the sprinkling of pistachios on top. The sundae reminded me of back home, but Brits would probably call it more of a Knickerbocker Glory as it was dotted with meringues throughout. I didn’t see what the final bill would be (I was a guest of Bistro du Vin), but we estimated it out at around £120 with water and wine. The wine, by the way, was excellent. They have this clever little top up card that allows you to try some really fantastic wines by the glass that in normal restaurants would only be served by the bottle. I’ll admit it was a mixed bag. A bit on the pricey side for just a normal meal out, but good for a slightly more special occasion. 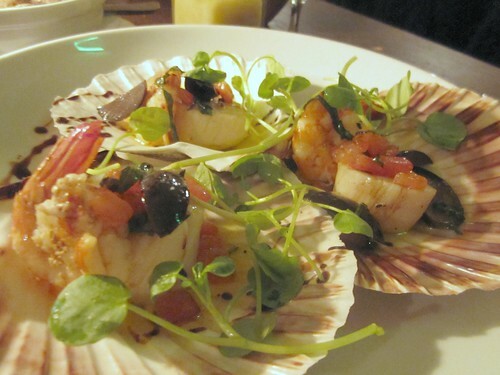 If you order smart, and stay away from the ludicrous scallops, you should be fine. I don’t get to travel within the UK too often unless it’s with work. Most of my friends have always lived in London, so until recently when my friend Dom quit his job and moved up to Leeds to go back to school and become a teacher, I was sad – but also a little excited I could go visit. Six months later, I finally made it ‘oop norf’, as they say. 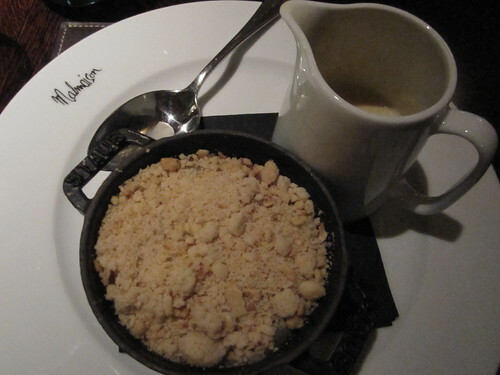 Before I went though, the lovely Diana Massey had got in touch with me about the Brasserie at The Malmaison Hotel. Although I generally don’t do invite to review restaurants without being anonymous, I said yes. A new city, no clue where to eat, and a friend who went from PR wages to being a student at 27 – if there’s anyone who deserves a nice meal out on the house, it’s him. The hotel itself is beautiful – rich plum colours and twisted wrought iron sculptures and light fixtures – it does very much ring of Paris in the 30s. Just beautiful. A bit early, we settled in the bar for a quick drink before being whisked off to our table, which was set off from the main dining room, a big comfy half-moon Mafia-style booth that gave a nice view of the rest of the room. We were served some bread and a nice tapenade to start. The maître d was serving us, which at first I was a little put off by (I don’t like special treatment), but as the room filled up, he looked after the whole section. Perhaps they were short-staffed, or perhaps he is just the kind of manager that really gets stuck into it – either way, we were all looked after well. 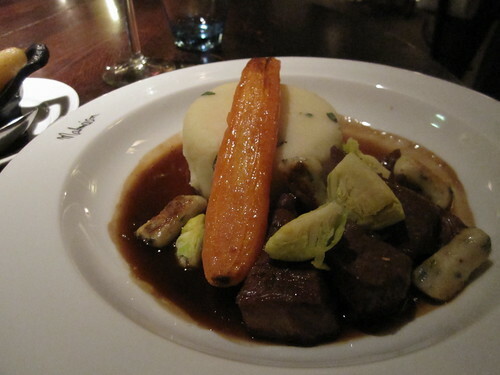 The menu is mostly French with some British inspiration. The most important thing about it though is that everything, and I mean everything, is local. 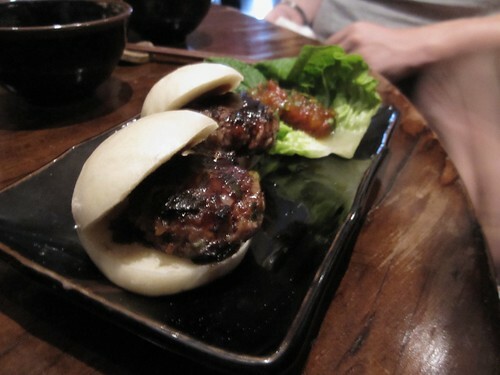 They make quite a big deal of this on the menu, which made me think it might not be that common in Leeds. Even my starter, the Pigeon with Spiced Vegetables and Bread and Bay Sauce (£7.50), I was warned twice that it was killed locally and so I should be careful of little bits of shot in the meat. How rustic. Luckily, I didn’t get any. I think pieces of leftover metal in my bird might have been a bit much. 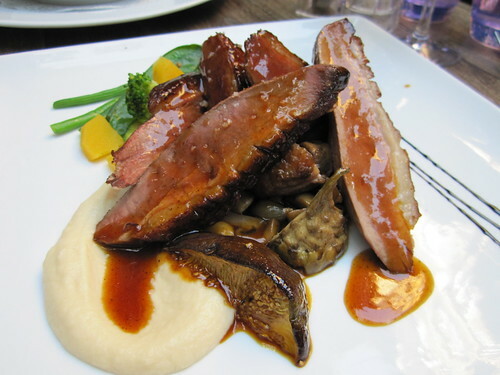 The mild creamy bread sauce with well cooked vegetables (including some fairly tart beetroot) was a hit, but the pigeon itself was a little tough. It was the right colour – it didn’t *look* overdone – but it was really missing the tenderness that bird really needs. 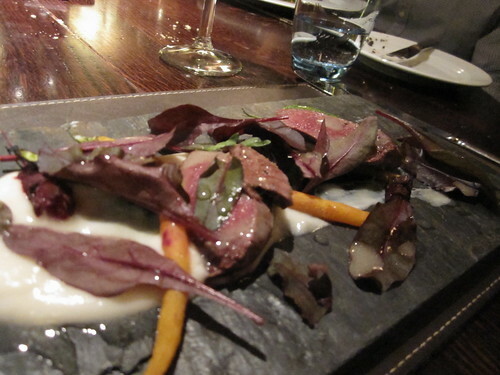 Of course, my last brush with pigeon was at Heston’s Dinner, so I admit I have been a bit spoiled. I loved the streaky (American) bacon garnish on this. Salty crispy goodness. 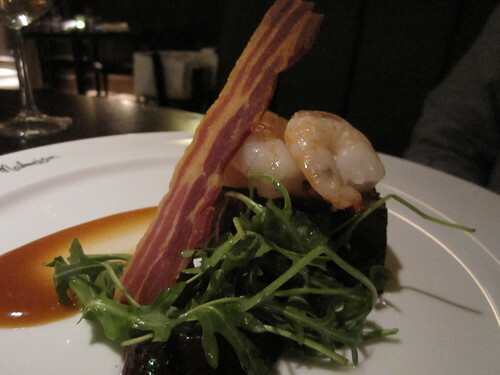 The prawns were fine and the slightly sweet sauce worked well with the dish over all, but the pork belly itself – again – just a tad overdone. A stonkin’ huge portion well worth the 14 quid. 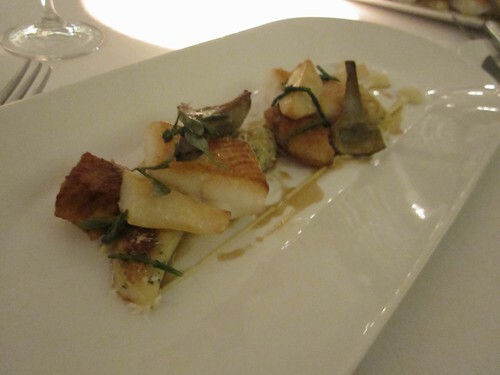 The fish was delicate, flaky and the butter sauce was nice. I had this was a side of New Potatoes, which were also quite good. If I could complain about anything, it would be the skin was lacking in crispness, which while not a necessity, is always a nice perk when having this type of fish. I’ll admit I’m not much of a mutton fan, but I found this too, to be a bit dry. 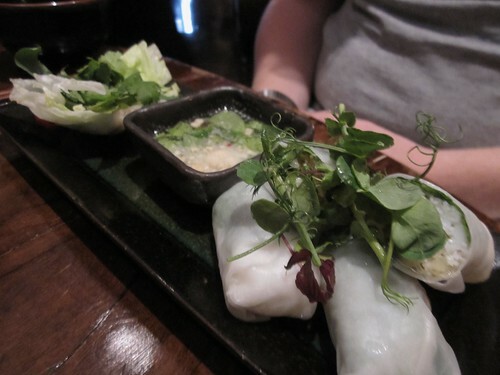 The herb dumplings were nice and added a bit of much-needed moisture, but they weren’t quite large enough to do the trick. Both a good idea in theory, but they both fell short. 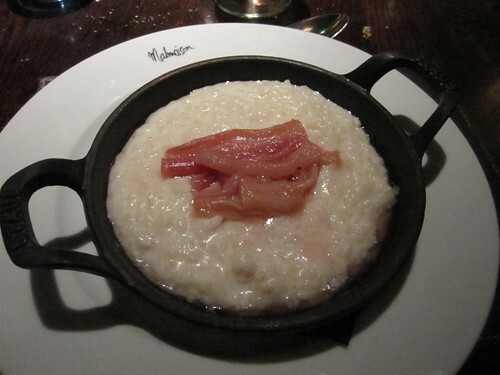 The flavours in my rice pudding were lovely, slightly sweet, slightly tart, slightly spicy, but the rice was underdone. The crumble’s apple was perfect, but the actual crumbs were dry and tasted a bit too similar to cardboard, if you ask me. Beach Blanket Babylon looks like someone took a beach hut, decked it in black chandeliers and velvet, and decided that it somehow warranted charging £11 for a drink. It’s the sort of place that tries really hard to be good, but when you strip out all the glitz, it’s still just a shack with a nice view. 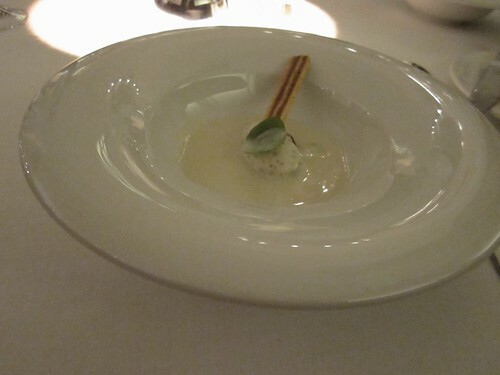 I started with the calamari, which was served in a bamboo basket with a Japanese soup spoon full of aioli. 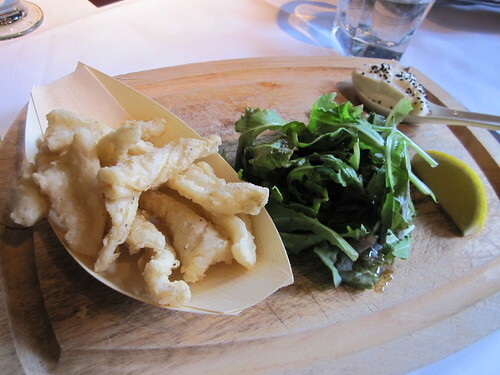 The calamari was cooked nicely, but was largely devoid of any flavour in the batter, instead relying on the fairly rich dipping sauce to give it a bit of oomph. 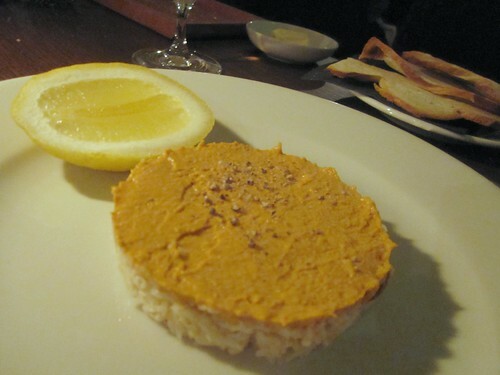 We also had the liver pate, served with bread and a leafy salad. 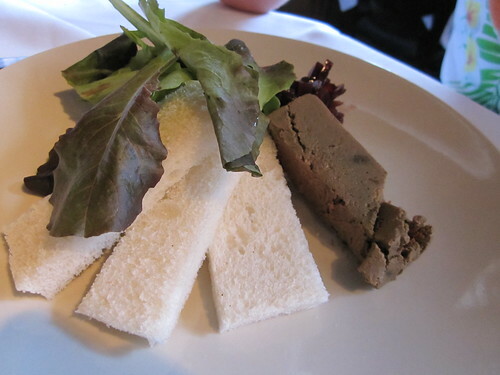 The pate, looking more like bland paste, wasn’t very nice at all. 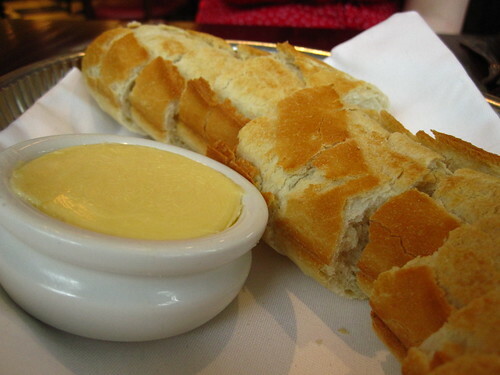 The presentation was horrible, and the ‘bread’ was nothing more than white bread with the crusts cut off. The sort of bread you can get in any random corner shop. I was not a fan. 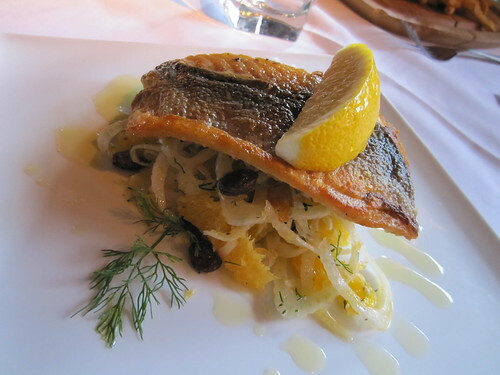 Luck turned with my main, a lovely seabass served over fennel and oranges. 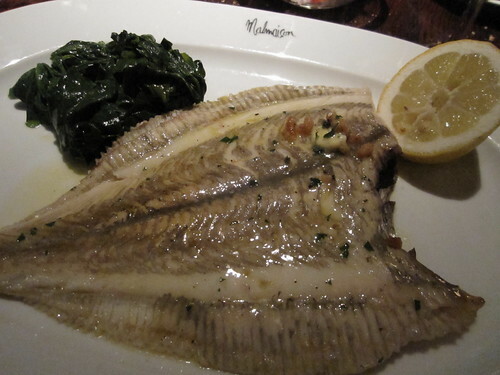 The skin was crispy while the fish oh-so-tender. 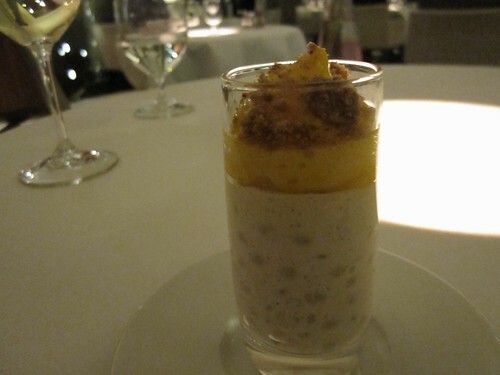 The fennel and orange gave it a nice summer freshness that meant I did not feel overstuffed after eating it. I couldn’t have had any more or any less. 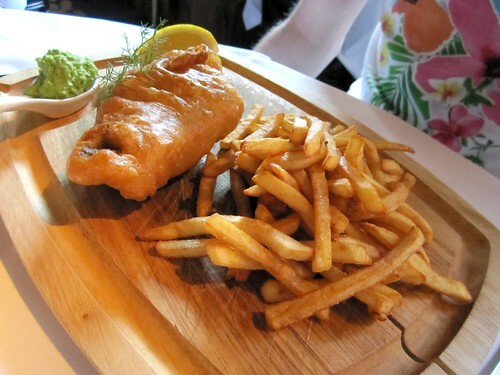 The fish and chips, however, were, like the calamari tasteless and overly greasy. The chips/fries were so overdone you couldn’t even tell they used to be potatoes. The mushy peas (also served in a soup spoon) went largely untouched, due to the worst combination of no taste up front and a weird aftertaste. I should have listened to others on this one. The whole bill came to around £90 including 1 glass of wine, 1 beer and service (luckily I had a voucher or else I’d be hopping mad). I’d say it would be a good atmosphere to go have drinks at, but really, no amount of nice decor would make it worth it. 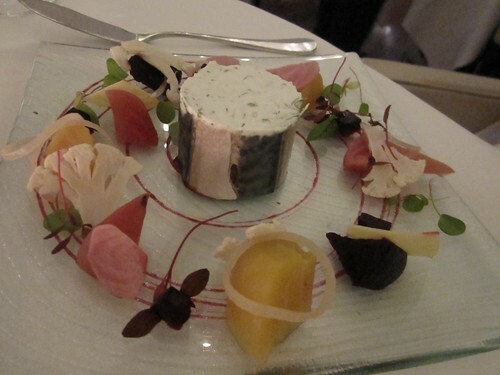 Just a bit a foodie photo fun from my last trip to Paris. Unlike last time I went, I didn’t go overboard with fancy expensive restaurants, instead just stumbling into places when hungry. Unfortunately, I didn’t find any undiscovered gems that way, but I can’t say I had anything horrible, and we saved a lot of money! 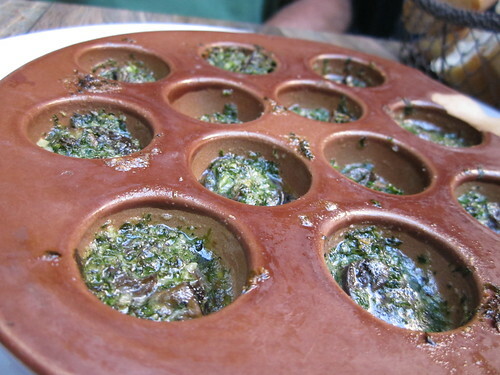 And how could you go to France without l’escargot? I ate other places, but sadly none of them were fantastic enough to warrant proper posts. 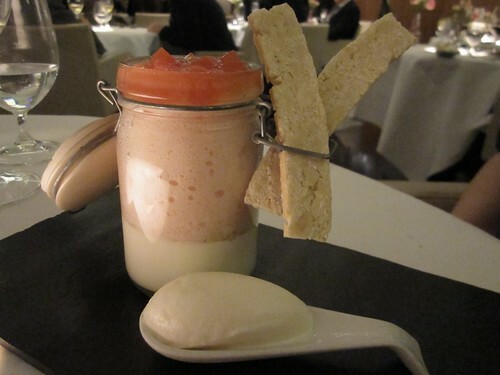 I also currently have about 9 drafts in my folder of London restaurants I’ve yet to write about. A girl can only do so much! My friend Jaz and I were in order to have a girly gossiping lunch. It was the Saturday before Valentine’s day, and I hadn’t thought to check out the Toptable deals, which meant that most places were either booked or not doing any offers. Le Bouchon Breton up top at Spitalfields Market was the only one who had an offer on (50% off food). So that’s where we went. I got there early, and ordered a glass of wine. We were eating about 3pm, but the place was still relatively busy. Lots of couples, a few families. Everyone looked a bit unhappy though. Jaz showed up, and we were given some fresh bread. We ordered a bottle of the wine that I was drinking. When our server came back with another glass, and I mentioned we wanted a bottle, he just put the glass down anyway, and said ‘Oh, well, take this anyway!’ Very cool of him. Looking at the menu, I had no idea what to get. 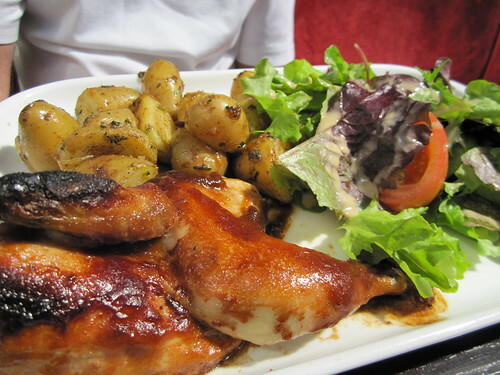 It started occurring to me that maybe French food wasn’t really what I wanted, and that maybe I shouldn’t have been so obsessed with getting half off my meal when really all I was craving was a burger and chips. 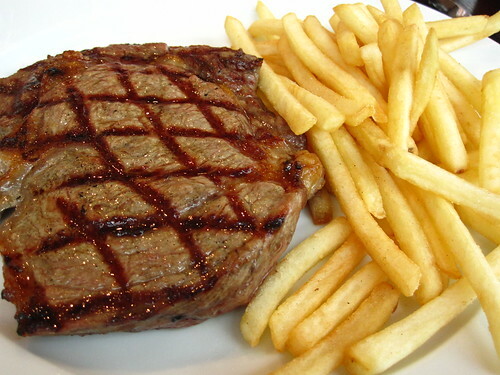 I compromised by getting a Rib-eye with ‘les frites’. 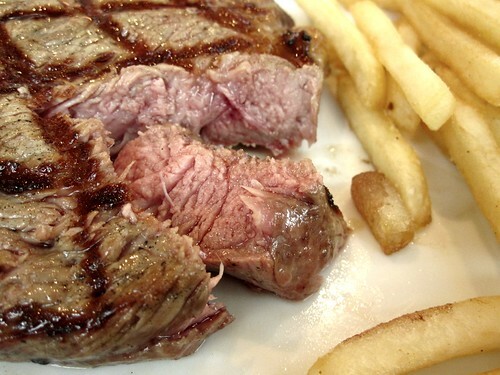 I asked for the meat rare to medium rare, and the server repeated back to me ‘Medium well?’ (he was French). 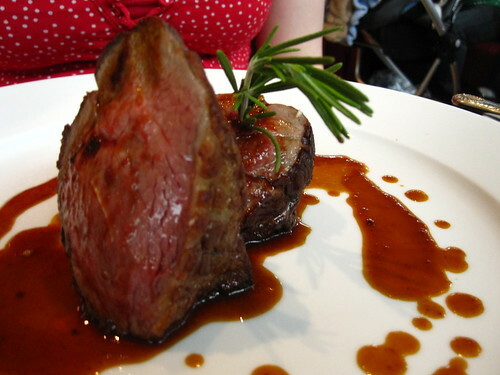 I said ‘No, rare, please!’ Sure enough, when it arrived, the steak was cooked all the way through. The fries were good, though. 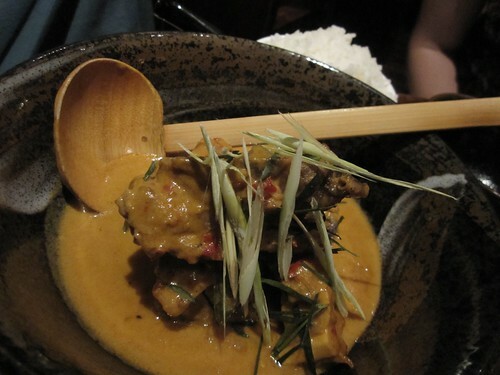 I also ordered a side of peppercorn sauce which gave flavour to what otherwise was a complete waste of beef. Jaz’s lamb was nice though. Much prettier. It came with a side of beans that were atrociously bland though. All in all, with the Toptable discount and the free glass of wine, we ended up spending less than £20 each – a steal. Should mention that the service was really really good too. However, like with most ‘Offer’ meals, I’d have a hard time imagining being happy paying full price for the same thing – especially when I just wasn’t impressed with my food at all.